Barrel Length: There are six barrels, each of which is 19 1/8”. Sights / Optics: The front sight is a tall brass Patridge style blade held in a slotted base which is dovetail set to the semi-circular brass bracket at the front of the barrel assembly. The rear sight is a brass post with a dovetail in its top surface that can be raised and lowered manually and held in position with a threaded screw at the back of the receiver that has a large knurled head. The dovetail is empty – the sight itself is absent. Frame and Construction The barrel and receiver assemblies are bolted to a rectangular shaped frame that holds the shaft through the center of the barrel assembly at the front and is open at the rear, where it is bolted to the sides of the receiver. The breechblock/magazine support is attached to the left side of the frame and pivots over the top chamber assembly at the rear of the barrels. There are 0.625” steel rods attached to each side of the frame about 1/3 of the way along its length from front to back. They are clamped into the bronze clamps on the front of the adapter plate of the mount. The frame is about 27” long. The entire gun is 33 ½” long from the front of the center shaft in the barrel assembly to the back of the large brass knob on the rear of the receiver. Type of Finish: The barrel assembly, including the chamber assembly, is blued. The receiver and magazine support are brass and the crank handle is finished in the white. The frame looks very much like unfinished hot rolled steel, or it could have had a very thin coating of bluing applied. Bore Condition: The bores are bright and the rifling is sharp. There is no erosion. Overall Condition: This Gatling gun retains about 80% of its metal finish. The frame shows very light pitting which may be its original finish. There are a few spots of pinprick surface erosion along the top of the left side of the frame, with a small compression mark on both the top inside and outside edge near the mounting bar. The top surface of the frame on the right side shows a large mark through the finish. The barrels show a sprinkling of pinprick surface erosion. The receiver is developing a mustard colored tarnish and has a compression mark on its left side. There are several tiny compression marks on the top edges of the magazine support, and its inside surfaces are dark with tarnish. The crank handle shows tiny dark spots of erosion and a few tiny compression marks, and its shaft partially covered with small dark spots of erosion. The screw heads are sharp and the markings are clear. Overall, this Gatling gun rates in about Very Good condition. Mechanics: The action functions correctly, and the three legged mount swivels smoothly and locks up tightly. We have not fired this rifle. Box, Paperwork & Accessories: The Gatling gun comes with two mounts and two boxes of oak ammunition boxes. The first mount is wheeled and designed to be towed. It has two 28” oak steel clad wheels with 16 spokes. The axle is oak with steel collars on the wheels. The tongue is a 34” long piece of oak that is 2 ½” in width and 2 ¾” in height, supported along its bottom surface a steel plate. The front of the tongue has a steel hitch assembly with a 1” hole in it for slipping over a pin on the towing vehicle and a threaded coupling for attachment of a wooden handle, and two steel handles bolted to each side for maneuvering the mount once it is uncoupled from the towing vehicle. There is a large bronze plate in the center of the axle for mounting the gun on with teeth on its rear curved edge for locking the gun into position. Included with the mount is a two foot long oak handle with a threaded brass end for attaching to the hitch at the front of the tongue. The mount is in Very Good condition. The second mount is a three legged mount. The oak legs are 30” long with steel feet. They are 2 ½” square at the top and become rounded near the bottom. The legs fold together for carrying and storage, and are independent, allowing the mount to be leveled. There is a steel toothed plate mounted to the top of this mount, to which an adapter plate is attached, which rides on bearings. The adapter plate swivels, and can be locked into position with a steel gear and handle assembly that is attached. The adapter plate also holds the coupling to which the gun is clamped. The adapter plate can also be used on the first mount, and is used for traversing the gun while firing or locking it in position to fire at a fixed position. The mount is in about Very Good condition. The boxes are made with dovetail joints at the corners with heavy blued steel hinges on the lids and heavy folding blued steel handles on the ends. The lids are secured with blued steel clasps. The first box has four compartments: a full length compartment in the front for magazines, a compartment on each end for storage of cartridge sleeves and a compartment at the back with lid for storage of tools. The lid is precisely fit into the compartment and has two holes for grasping it for removal. This box is in about Excellent condition with only a few light marks in the wood and metal furniture. The tool compartment holds a five piece T-handled steel cleaning rod with slotted tip, a black nylon bore brush, a ½-7/16 open end wrench, a heavy 1 1/8” open end wrench, and a small Allen wrench. The cleaning rod is in-the-white and the wrenches have black painted handles. There is also an oak and blued steel cartridge deflector that fits on the right side of the gun and deflects the spent cartridges in their sleeve as they fall out the bottom of the gun. It shows compression marks in the oak and powder burns at the top near the hinge. Each of sleeve compartments can hold five rows of 8-sleeves, and there are a total of 68 loose sleeves, plus 42 more loaded in the magazines. There are a total of three blued magazines that can hold a total of 21 cartridges each in their sleeves. The magazines have a spring loaded clip on the end which retains the cartridges until engage by the rotating chamber assembly. In addition to two cartridge sleeve compartments, the second box has a large “T” shaped open compartment for storage of magazines and a tool box, and has a wooden tray that rests on the top of the tool box and magazines. This box is in about Very Good condition. It shows rust on its metal furniture but only minor marks in the wood. This box has two empty magazines with 80 loose sleeves. The tool box is made out of stamped sheet metal with a blued finish. A circled “US” is stamped in the lid, which is hinged to the bottom of the box which has a folding heavy wire handle. The inside of the tool box holds a five piece blued steel cleaning rod with a ring handle and a slotted tip, a black nylon bore brush, an open end wrench, a small punch and a large and small Allen wrench. Our Assessment: From Wikipedia: “The Gatling gun is one of the best-known early rapid-fire weapons and a forerunner of the modern machine gun. Invented by Richard Gatling, it is known for its use by the Unionforces during the American Civil War in the 1860s, which was the first time it was employed in combat. Later it was used in the Boshin War, the Anglo-Zulu War and still later in the assault on San Juan Hill during the Spanish-American War”. 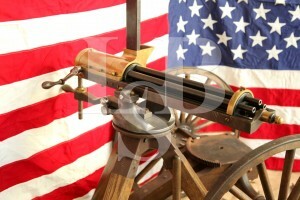 This is a ¾ size replica of the Model 1862 Gatling gun. It is a magazine fed 6-barreled gun chambered in .38 Special. Its barrels are blued and the receiver is brass. It comes with two very nice oak boxes of accessories including five blued magazines, 190 cartridge sleeves, several wrenches and two cleaning rods. Also included are two mounts: a fixed three legged mount and a two wheeled mount which was original designed for towing behind a vehicle. The gun doesn’t seem like it has seen a lot of use, and has probably just been displayed for most of the last 39 years. It shows a few marks in its finish, tarnish on the brass parts and a few scattered spots of pinprick surface erosion on the barrels. It is missing its rear sight blade. This Gatling gun comes with a host of accessories and appears to be in treat working order. This is great for having a party at your shooting club, or for Civil War re-enactors. Or, just set it up in your gun room as a conversation piece.